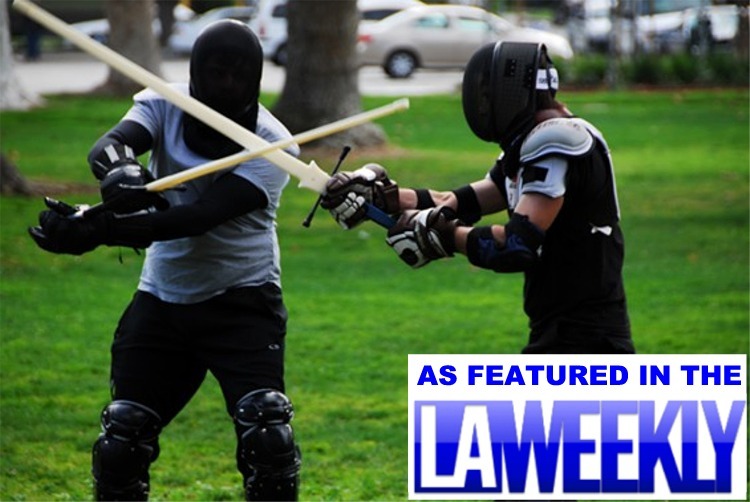 We are a non-profit historical fencing school serving the greater Los Angeles area. 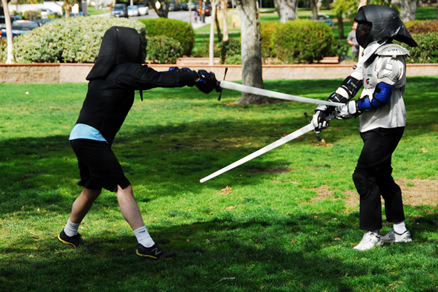 Our fencing classes are taught in a supportive, community-oriented environment. 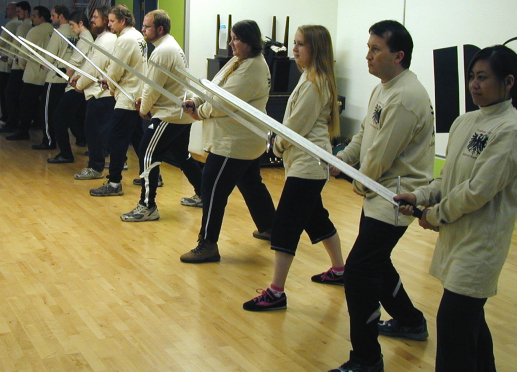 In addition to medieval longsword classes, we teach a wide array of weapons including rapier, dagger, grappling, spear, pollaxe, halfsword, sickle, messer, sword and buckler, and staff. 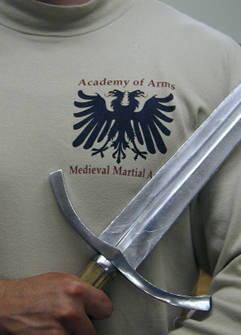 These weapons are all part of the Historical European Martial Arts, or HEMA. 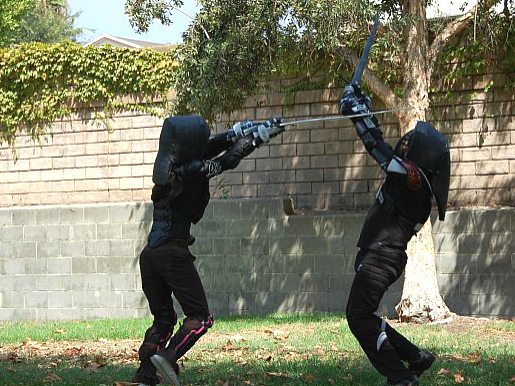 We are currently accepting students for fencing lessons in the Los Angeles area. Please note: historical sword fencing is the medieval predecessor of modern olympic fencing. We approach it as a martial art, not a sport. 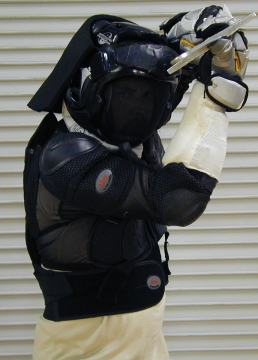 Be advised that this is contact work, not stage combat. Students begin with plastic training weapons, advance to blunt steel, and eventually do limited work with sharps. Our classes are available to adult women and men but we do not teach anyone under 18 years of age. Please note: we do not normally dress in costume. Some of our students who elect to participate in certain public exhibitions may wear costumes on occassion. Look below on this page for pictures of our regular classroom environment. The Los Angeles Regional Food Bank is our school charity and we work with them to help fight hunger in our community! 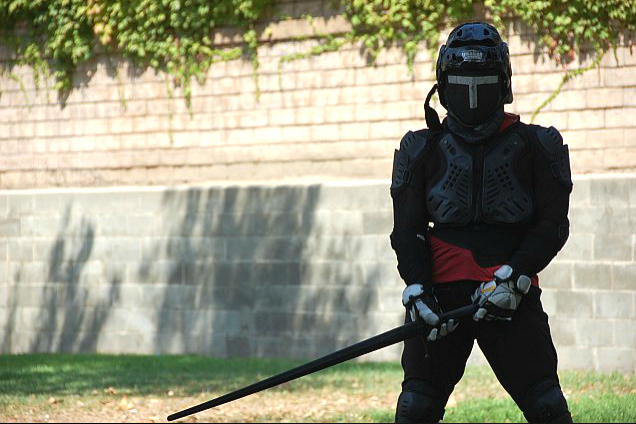 Click here to apply for our Martial Studies Scholarship. Click here to check the roster of our active students and their certifications. Anyone absent from this list is not a member of our organization.